The people over at Sigma recently got in touch to see if I wanted to review a set of their make-up brushes. Considering I had been toying with the idea of buying some of these myself I took them up on the offer. So for the past few weeks I have been testing the brushes out and now I’m ready to share my thoughts. Before I start going into detail I should state that I am not comparing these to MAC brushes in any way as I don’t own any – unless you count the fake one I made the semi-mistake of buying on ebay (by semi-mistake I mean that it was a mistake buying fake MAC, but I actually quite like the brush anyway, so doesn’t count as a whole mistake). My current brush collection includes a bit of a random mixture of mostly elf brushes, with some No7 (some of which I like, others that I really don’t) one Prestige powder brush and a kabuki that I can’t remember where it came from (and the name has worn off). I in no way profess to be an sort of make-up brush expert at all and simply form opinions based on how I find these brushes as a consumer. So, enough waffle – onto my opinions. 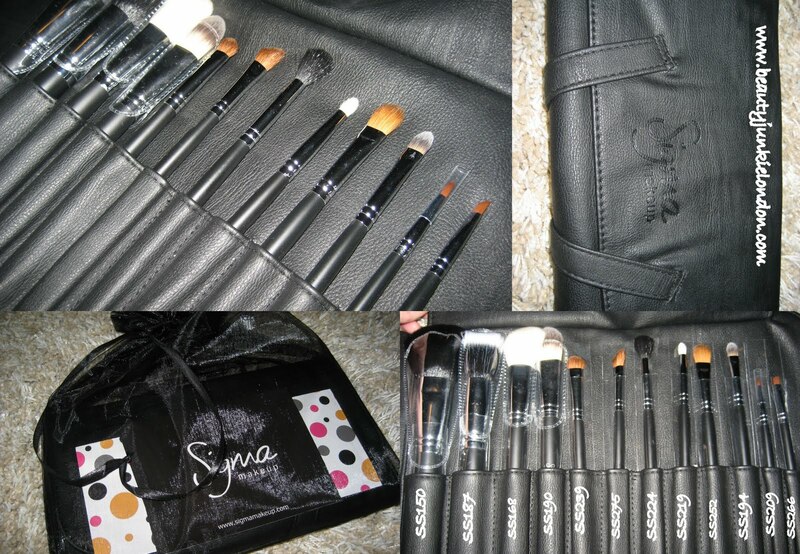 I was sent the Sigma Essential Brush Kit and my first impressions of the brush wrap (a fake leather wrap with pouches for the included brushes plus space for a couple more) is that it’s a decent quality and doesn’t look or feel plastic. It wraps up snug so is ideal for travelling and secures with a magnet clip. The wrap contains 12 brushes for face and eyes (I’m not bothered by lip brushes at all, so for me this is ideal) it comes with a guide to each brush which is useful for anyone who isn’t an expert (like me!). Having said that, although I’m no expert, being a beauty blogger I have picked up on what most brushes are used for – but things like the duo fiber/skunk brushes would have baffled me pre-blogging. So, the main event – the brushes. I’m going to quickly run through each one (in the order they come in the brush roll, they are labeled on the collage picture) and share what I think and then go for a bit of a summary at the bottom of which ones are my favorites from the kit and my overall view. SS150 Large Powder Brush – when they say large, they mean it. The guide says the bristles on this are natural but they feel quite synthetic to me. The brush is dense with minimal shedding so far, good for applying powder or bronzer. SS187 Duo Fibre Brush – this is similar to my fake MAC one and is a mixture of natural and synthetic fibres. I really like duo fibre brushes, I think they are great for all sorts of application – from buffing foundation to applying a dusting of powder for a less cakey affect. This one is very soft, but not very dense so it doesn’t buff quite as well as I would hope – but the smaller size (than my fake MAC) means it is easier to get into corners with. SS168 Large Angled Contour Brush – this natural bristle brush is very soft and picks up product well. It has stained a bit since I started using it, but that is to be expected with pale natural bristles. This has kept it’s shape and barely shed despite being washed a couple of times. SS190 Foundation Brush – the synthetic bristles on this mean that it doesn’t absorb product, which is good. Plus the shape (a tapered end) lends itself well to applying foundation easily all over and blending into corners. My current foundation brush is the No7, that I had loved till I tried this – the slightly different shape makes all the difference to application. SS239 Eye Shading Brush – This is similar to the c-shaped brush from elf that I really like for applying colour (and have a couple of) this is a slightly wider shape and the natural bristles are slightly softer than the elf version, very soft on the delicate eye area and doesn’t drop as much product as my elf equivalent. SS275 Medium Angled Shading Brush – Similar density and softness to the SS239 but a different shape. This is one of the brushes I don’t reach for as often as I haven’t quite got the hang of using angled eye brushes. SS224 Tapered Blending Brush – Another one with natural bristles that feel quite synthetic to me, this brush is quite large for the eye area so not one for applying colour really as doesn’t allow for precision. Very soft, not very dense but nice and fluffy so does as it says on the tin – blends. SS219 Pencil Brush – the guide says to use this for precise application of colour on the crease, outer corner and upper and lower lash line and that is precisely how I have been using it. It’s the ideal shape for precision and the dense natural bristles pick up lots of colour without too much fall out. This is another one that has survived a few washes with little or no fall out so far. SS252 Large Shader Brush – another one where, when they say large they really mean it. The guide says to apply cream colours or primers with this or for use all over the lid. It really means all over the lid, the size of this brush is about 1/4 of my whole lid, so not one to do anything precise with. I do find the natural bristles seem to absorb a bit too much product for my liking. SS194 Concealer Brush – the final face brush of the set, the size of this is absolutely ideal for covering either under-eye circles or spots, it’s tiny so ideal for precision work. This one has totally blown my No7 Concealer Brush out of the water in comparison – the No7 version is basically a slightly smaller foundation brush, but far too big in hindsight to apply product to small areas with. This one is ideal as the stiff bristles and small shape mean application and blending is easy. SS209 Eye-liner Brush – I didn’t manage to apply anything too precisely with this one as the bristles are quite soft so spread apart when using them to apply product, having said that I have only used with powder rather than liquid and have a feeling liquid would be better. SS266 Small Angle Brush – this is my brush of choice for applying precise eye-liner, rather than the SS209. This has synthetic bristles but they feel very, very soft. Another one that I have used for powder but would also be ideal with liquid. So that’s each of the brushes individually – my general thought is that this is a good investment. I really can’t see myself ever being willing to spend the sort of money to get MAC brushes, perhaps a couple of individual ones that are real ‘must haves’ or somehow unique in some way, but certainly not a whole set. I feel that all I need is a functional set of brushes that help me to apply and blend make-up enough to look good – I don’t do anything artistic enough to justify the expense of around £20 a brush. This kit is $69 from Sigma (they ship to the UK) plus shipping costs, which I think is excellent value. Having being given the chance to try these out for free I would happily consider going back to the brand to buy a couple of other individual brushes – having been looking at the website I have my eye on the SS197 flat topped synthetic kabuki, the SS188 small duo fibre brush and the SS182 buffer brush – if anyone owns any of these already would love to know what you think, please comment below! These brushes were sent for free for consideration for review. All opinions are honest and my own. Wow what an amazing set!!! I have the SS188 small duo fibre brush and I have to say… don’t waste your cash. Get the MAC version. I have had nothing but problems with mine, and once you take shipping from the US into consideration, Sigma brushes just simply arn’t good value for money for UK buyers, not when we have Body Shop, Ruby & Millie and Crown brushes all on our doorstep. My SS188 has consistently shed (I have to spend a good minute trying to pick black fibres off my face after each use) and bleeds dye every time I wash it. I was seriously unimpressed. Gossmakeupartist on youtube had a similar experience. I also have the angled eyeshadow brush (I dont have it to hand) and I find it’s really flimsy which doesnt help when you’re trying to apply colour to the crease. All in all – a serious disappointment. The company spends a great deal of cash wooing bloggers with free products which does explain some of the hype. @TheAmateurKit Thanks for the feedback, that really is helpful. Of course the fact that I was sent the brushes for free does mean that I was only looking at them as products without factoring in the potential shipping charges and overall cost, but as a consumer I like them – again, without comparison to more expensive/arguably better quality versions. That brush set is every girls dream. I want those too. I just come across your blog while searching for sigma brushes, I’m in two minds to buy this set or the Real Techniques by Sam, which would you say are better? I’d say go for the Real Techniques – whilst the sigma is good as an equivalent for mac and the quality is good. There’s something about Real Techniques that feels so much better quality. This is amazing. I love these brushes. This is amazing! I love these brushes.